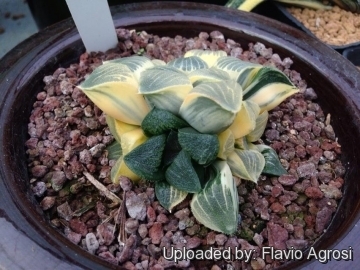 Haworthia bayeri f. variegata hort. Origin and Habitat: Garden origin. The natural species comes from South Africa, Western Cape: Little Karoo, from Oudtshoorn in the west till Uniondale in the east. 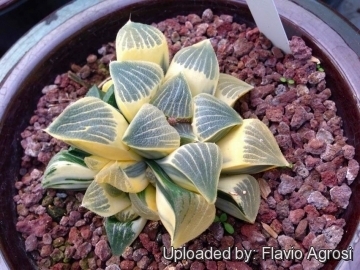 Description: Haworthia bayeri is one of the most spectacular retuse-leaved species highly sought-after for its beautiful leaf markings, but is slow growing and still very rare in cultivation. The random fine white white strips across the olive-green to red leaf surfaces is extremely variable and a number of nicely marked clones has been selected by growers, especially in Japan. The best of this clones have a "traffic stopping" appeal and are high-priced. Some specimens have an extra shiny almost glassy surface. Habit: Rosettes mostly solitary, stemless, 8-10 cm in diameter, but occasionally may form a small mound over time. Leaves: 15-20 triangular, retuse, lime green, dark brownish-green, blackish-green, or reddish, variably striped with creamy-yellow, yellow or pink, slightly scabrid, more or less glassy, keels and margins with minute spines or smooth, tip rounded and not pointed, the end-area opaque, cloudy-transparent, with sparse reticulate patterning or longitudinal white or pink lines. Inflorescence: Raceme lax (bearing 15-25 flowers), up to 30 cm tall, single, unbranched, erect and wiry. Flowers: Whitish. The flower's Structure, colour and fruits are typical of the genus. Haworthia bayeri J.D.Venter & S.A.Hammer: is a retuse-leaved species with variable white strips across the olive-green to red leaf surfaces. Distribution: Western Cape, Little Karoo, from Oudtshoorn in the west till Uniondale in the east. 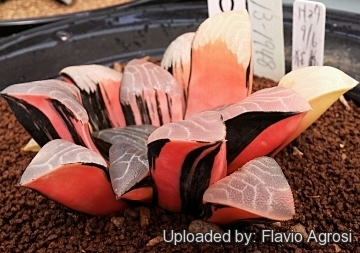 Haworthia bayeri f. variegata hort. : variegate form. 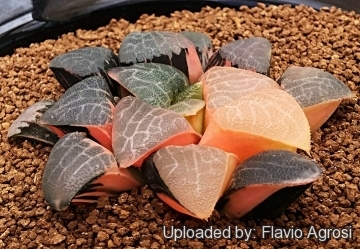 Haworthia bayeri cv. Kelikete: This is one of the best clones whit beautiful reticulate patterning or and extra shiny almost glassy surface. Cultivation and Propagation: Haworthia are of easy cultivation and relatively low maintenance and can grow on window sills, verandas and in miniature succulent gardens where they are happy to share their habitat with other smaller succulent plants, or in outdoor rockeries. Growth rate: Haworthia bayeri is a very slow-growing plant that usually do not offset. Soil: They are tolerant of a wide range of soils and habitats, but prefer a very porous potting mix to increase drainage. A non-acid soil is ideal. You can grow a plant in a small pot for years and have perfectly happy plants. For best results, use a shallow pot. Watering: During the hot summer months, the soil should be kept moist but not overly wet. During the winter months, water only when the soil becomes completely dry. Wet soil quickly causes root and stem rot, especially during chilly winter months. No water should ever be allowed to stand around the roots. Low ambient humidity is always needed. Fertilization: The plants are fertilized only once during the growing season with a balanced fertilizer diluted to ½ the recommended strength. Hardiness: Although the plant will survive mild frost if kept dry (hardy as low as -5° C) it should be protected from severe cold and prolonged frost conditions. 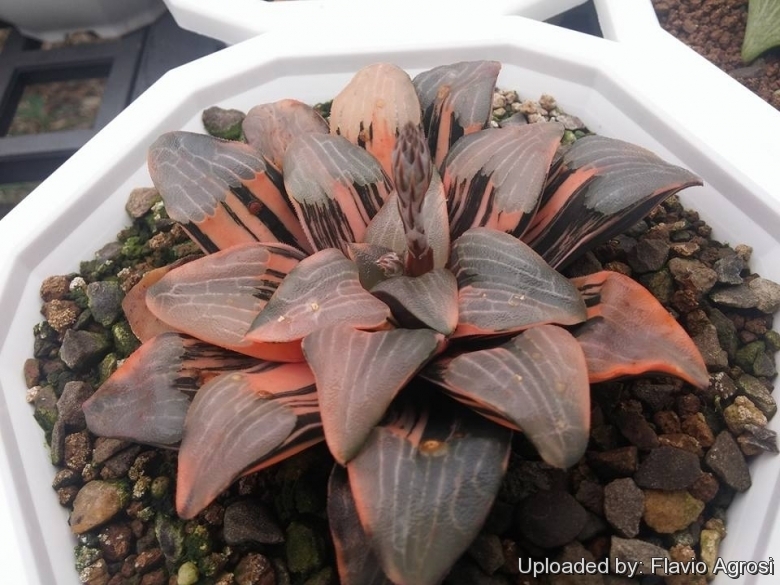 Rot: Rot is only a minor problem with haworthia if the plants are watered and “aired” correctly. If they are not, fungicides won't help all that much. Care must be given in watering, keeping them warm and wet while growing, and cooler and dry when dormant. Remarks: Haworthias are best planted in a shaded and airy part of the greenhouse, and not too close to the glass roof or sides of the house as the plants can overheat during hot spells. Propagation: It remains usually solitary, so propagation should be done by seeds or leaf cuttings in spring or summer. To propagate by leaf cuttings, remove a leaf and let it lie for about one month, giving the wound time to heal. Then lay the leaf on its side with the basal part buried in the soil. This leaf should root within a month or two, and small plants will form at the leaf base.